Proteus Syndrome is a Segmental Overgrowth Syndromes. In these syndromes, regions of the body growth without control, causing deformation and disabilities. According to the clinical presentation, we distinguish the SOLAMEN Syndrome (Epidermal Nevus Syndrome), the Proteus Syndrome, Lipomatosis, Arteriovenous Malformation and Type 2 segmental Cowden syndrome. This syndrome is an exceedingly rare (less than 100 bona fide cases have been recorded), progressive disorder that manifests as asymmetric, disproportionate overgrowth affecting tissues derived from any germline layer. It is characterized by macrodactyly, vertebral anomalies, hyperostosis, abnormally distributed adipose tissue, asymmetric muscle development, connective tissue and epidermal nevi, and vascular malformations. (Proteus Syndrome: an update. 2005). The term Proteus syndrome was coined by Wiedemann in 1983, after the mythical Greek God Proteus, whose name means “The polymorphous", who could change shape to avoid capture. The term is appropriate as the Proteus syndrome exhibits tremendous morphologic variability with time. It is thought that Joseph Merrick, an Englishman who lived in the late 19th century and became the subject of the play and film The Elephant Man, had the Proteus syndrome. Merrick’s condition manifested while he was a young boy, starting with growths over various parts of his body that continued to grow and disfigure him as he grew older, in addition he had asymmetric growth and development of his limbs (A mosaic activating mutation in AKT1 associated with the Proteus syndrome. 2011). About 20% of patients with Proteus syndrome have had premature deaths, most commonly from pulmonary embolism, postoperative complications, and pneumonia. Vascular malformations, relative immobility, and surgical procedures predispose to deep venous thrombosis, resulting in pulmonary embolism. (Reassessment of the Proteus syndrome literature: application of diagnostic criteria to published cases. 2004.). Patients with Proteus syndrome and/or their families should make their health care providers aware of the risk of deep venous thrombosis and pulmonary embolism. Symptoms warranting investigation include calf pain, calf or leg swelling, shortness of breath, and chest pain. Patients undergoing surgical procedures should be evaluated by a hematologist to determine coagulopathic potential and to determine whether antithrombolic prophylaxis is indicated (Sudden death caused by pulmonary thromboembolism in Proteus syndrome. 2000.). Overgrowth in Proteus syndrome is not only disproportionate and asymmetric, but also progressive, distorting, and relentless. (Radiologic manifestations of Proteus syndrome. 2004). Overgrowth may also include megaspondylodysplasia and enlargement of the spleen and/or thymus. The cerebriform connective tissue nevus is very specific with a raised, rugose, cerebriform-like lesion composed of highly collagenized connective tissue. It may occur on the plantar surface of the foot, the palmar surface of the hand, and more rarely on the chest, abdomen, back, lateral and dorsal portions of the fingers, and on the nose. A cerebriform connective tissue nevus is sufficient for the diagnosis of Proteus syndrome when present. However, some patients do not have this finding (Reassessment of the Proteus syndrome literature: application of diagnostic criteria to published cases. 2004.). Other lesions, such as wrinkling of the plantar surface of the foot or a plexiform neurofibroma in the same location, have often been confused with a cerebriform connective tissue nevus. Epidermal nevi, evident in early life, are tan, brown, or brownish-black in color. They are well demarcated, raised, and pebble-like in texture, often with a streaky appearance. Nevi are asymmetrically located and often multiple; they may be found on the neck, abdomen, flank, or extremities. Histopathological findings consist of acanthosis and hyperkeratosis (Cutaneous manifestations of proteus syndrome: correlations with general clinical severity. 2004). Vascular malformations may be of the capillary, venous, or lymphatic type, or may occur as combined channel anomalies, e.g., capillary and venous channels or capillary, venous, and lymphatic channels. They are developmental anomalies lined by flat endothelium exhibiting a normal, slow rate of turnover. They grow proportionately with the patient: they never regress, but they can expand. Lipomas are benign tumors of mature fat cells. They may occur in subcutaneous tissues, within internal organs, and occasionally within muscle by extension. Lipomas differ from normal fat; they have increased levels of lipoprotein lipase and a larger number of precursor cells than in normal fat. They may be encapsulated or nonencapsulated. Lipomas in Proteus syndrome may be single or multiple. They may occur subcutaneously or internally. Lipomas of the abdomen and thorax can be very aggressive despite their benign histology. Biopsied material to date has demonstrated nonencapsulation. Lipoprotein lipase has not been studied nor is it known if precursor cells occur more commonly than in normal fat. In the lipohypoplasia of Proteus syndrome, subcutaneous fat may be decreased or absent, most likely the former. It tends to occur on the trunk and limbs, resulting in accentuated bony contours. Dermal hypoplasia with reddish plaques of thinned skin may involve the the lower limbs, resulting in prominently appearing veins (Cutaneous manifestations of proteus syndrome: correlations with general clinical severity. 2004). renal/urologic abnormalities in about 9%. Craniofacial abnormalities are progressive, and abnormal modes of growth may include hyperostoses, cranial hemihyperplasia (resulting from hemimegalencephaly), craniosynostosis, unilateral condylar hyperplasia, and, rarely, cerebriform connective tissue nevus. Low frequency abnormalities may include epibulbar dermoids and hyperostosis of the external auditory canal (Proteus syndrome: clinical evidence for somatic mosaicism and selective review. 1993). Cohen (Proteus syndrome: clinical evidence for somatic mosaicism and selective review. 1993) described a facial phenotype in Proteus syndrome patients with mental deficiency and, in some cases, seizures and/or brain malformations. Manifestations include dolichocephaly, long face, minor downslanting of the palpebral fissures and/or minor ptosis, low nasal bridge, wide or anteverted nares, and an open mouth at rest. These facial features may even override the severe craniofacial distortion produced by bony overgrowth in some cases. Lipomas are the most common type. Several important low frequency tumors are known to occur. The most frequent of these is ovarian cystadenoma. Well in excess of a dozen cases have been recorded and bilateral instances have been noted at least twice. At least six cases of meningioma have also been described. Four testicular tumors have been observed to date, each of a different type. Two young patients with parotid monomorphic adenoma are known. This tumor is usually found in older men in the general population. In some cases, multiple tumors have been found in the same Proteus syndrome patient (Neoplasms in Proteus syndrome. 1995). Hemihyperplasia/lipomatosis syndrome is a distinct subset of hemihyperplasia. Cutaneous capillary malformations may occur in some instances. Mild-to-moderate signs are present at birth. Progressive overgrowth does not occur. Rather, it tends to be commensurate with growth of the child (Clinical differentiation between Proteus syndrome and hemihyperplasia: description of a distinct form of hemihyperplasia. 1998). Klippel–Trenaunay syndrome is a distinctive condition characterized by vascular malformations of the capillary, venous, and lymphatic types, unusual varicosities of the lower limb, lymphatic vesicles, venous flares, asymmetric limb enlargement (lower limb ∼95%) involving both soft tissue and bone, and macrodactyly, particularly of the toes. On occasion, the disorder has been confused with Proteus syndrome (Klippel-Trenaunay syndrome. 2000). We present a 16 years old boy who shows severe orthopedic manifestations, including scoliosis, overgrowth with a resultant discrepancy in leg length, and valgus deformity and distortion of the skeleton. It’s also possible to notice the characteristic cerebriform connective-tissue nevus, overgrowth and distortion of hands and feet, cutaneous vascular anomalies. This patient began to show the first signs of some kind of abnormality during his first two years of life: a hand rapidly started to outgrow the other and the legs initiated to deform. Eventually he was diagnosed with Proteus Syndrome at he age of three. Over the years he has had countless surgeries to stop the growth or debulk the lesions. AKT is now known to include a family of three closely related, highly conserved cellular homologues, dubbed AKT1, AKT2 and AKT3. 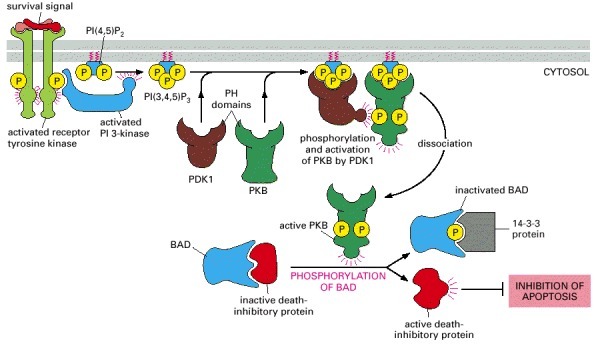 The encoded proteins are serine/threonine kinases that belong to the protein kinase B (PKB) family, and the AKT1, AKT2 and AKT3 proteins are also referred to as PKB, PKB and PKB, respectively (AKT signaling in normal and malignant cells. 2005). Akt plays a key role in multiple cellular processes such as glucose metabolism, apoptosis, cell proliferation, transcription and cell migration. Akt is involved in the PI3K/AKT/mTOR pathway and other signaling pathways. Dual phosphorylation is required for its activation. T308 is phosphorylated by PDK1 in the PI3 kinase pathway, and S473 is phosphorylated by mTOR in the mTORC2 pathway. The 'Lys-63'-linked ubiquitination of AKT1 by TRAF6 is important for its translocation to the plasma membrane, phosphorylation, and activation. When Akt is fully phosphorylated it translocates into the nucleus, undergoes 'Lys-48'-polyubiquitination catalyzed by TTC3, leading to its proteosomal degradation. Akt regulates cellular survival and metabolism by binding and regulating many downstream effectors, e.g. Nuclear Factor-κB, Bcl-2 family proteins and murine double minute 2 (MDM2). Cell survival: Akt promote growth factor-related cell survival. In particular, this molecule phosphorylates BAD making it dissociate from the Bcl-2/Bcl-X complex and lose the pro-apoptotic function. Akt could also activate NF-κB via regulating IκB kinase (IKK), thus result in transcription of pro-survival genes. Cell cycle: Akt play a foundamental role in the cell cycle. Activation of Akt was shown to overcome cell cycle arrest in G1 and G2 phases (Regulation of G1 progression by the PTEN tumor suppressor protein is linked to inhibition of the phosphatidylinositol 3-kinase/Akt pathway. 1999). Akt1 is also implicated in angiogenesis and tumor development. Although deficiency of Akt1 in mice inhibited physiological angiogenesis, it enhanced pathological angiogenesis and tumor growth associated with matrix abnormalities in skin and blood vessels. SOLAMEN SYNDROME AND PROTEUS SYNDROME: MOSAICISMS IN COMPARISON. A single mutation was identified as causing Proteus syndrome. This mutation affects a gene known to cause cancer, AKT1 kinase, causing this protein to be continuously activated. AKT1 kinase is known to be involved in regulating both cell proliferation and cell death. Mouse models with complete inactivation of AKT1 kinase have developmental abnormalities, with hypoplasia being a prominent feature. The opposite phenotype of the overgrowth seen in Proteus sufferers. Conversely mice that express continuously active AKT1 kinase have similar tissue overgrowth as seen in Proteus patients. Identifying AKT1 kinase as the causative mutation in Proteus syndrome explains some of the features of the disease as well as its similarity to another overgrowth syndrome, segmental overgrowth, lipomatosis, arteriovenous malformation and epidermal nevus (SOLAMEN). In Proteus syndrome many tissues can overgrow and cause deformation; most commonly bone, fat, and connective tissues are affected. Proteus syndrome patients can be misdiagnosed as suffering from SOLAMEN syndrome as both diseases share similar clinical manifestations such as asymmetric overgrowth of tissues. SOLAMEN syndrome is caused by a mutation in the gene PTEN (Segmental overgrowth, lipomatosis, arteriovenous malformation and epidermal nevus (SOLAMEN) syndrome is related to	mosaic PTEN nullizygosity. 2007). These muta- tions lead to loss of PTEN activity. PTEN normally regulates AKT1 activation. Inactivating mutations in PTEN cause increased activation of AKT1 kinase, explaining the shared clinical features of these two syndromes caused by different mutations in different genes. Proteus Syndrome is an uncommon syndrome with an incidence estimated to be less than 1/1000000 population. No recurrence has been reported in a family, but this disorder has been reported in discordant monozygotic twins. According to this aspects it can be hypothesized that Proteus syndrome is caused by a somatic mutation that is lethal when constitutive. Several groups have reported that the crucial point could be identified in PTEN mutations, but some others have argued that those people are clinically different from the one with PS, and more over the ones with certain PS do not show PTEN mutations. It’s for this reason that the group of Lindhurst et al. analyzed the possibility of a mosaic activating mutation in AKT1. The mutation leads to a constitutive activation of the protein through Ser473 and Thr308 phosphorylation. The specific mutation in DNA has been proved to be c.49G→A (predicting substitution of lysine for glutamine at amino acid 17), a mutation with an interesting aspect considering the central role of AKT1 in cell signaling. This is a functionally extreme important variant but uncommon in tumours, and at the same time this kind of mutation happens in a position not predicted to be highly mutable. Cells cultures from patient’s samples showed also that the mutation doesn’t occur in all the clones, but it’s proved that tissues from Proteus syndrome-affected people are a mixture of mutation-positive and mutation-negative cells, validating the mosaicism theory. The two factors above, in agreement with the mosaic form of mutation, could explain the extreme rarity of the disorder.